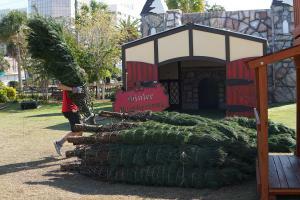 CLEARWATER, FLORIDA, US, November 22, 2018 /EINPresswire.com/ — On November 21, seventy-seven Christmas trees were delivered to Winter Wonderland, currently under construction at the Osceola Courtyard on the corner of Drew Street and N. Fort Harrison Avenue, in downtown Clearwater. With the trees now at the site, the holiday village is almost ready for Grand Opening on December 1st. The event is sponsored by the Clearwater Community Volunteers (CCV) and the Church of Scientology Flag Service Organization. The trees arrived after a multi-day trip by truck from a tree farm in Tomahawk, Wisconsin. The staff at the tree farm maintain over 300 acres of planted trees, planting an average of 6,000 trees a year. Before the trees are placed on the truck they are carefully trimmed by hand to create a perfect Christmas tree. Clearwater’s Winter Wonderland, opening December 1st, is also a food and toy drive for needy children and families. Visitors are asked to bring an unwrapped toy or non-perishable food item and put it in Santa’s sleigh. All of the donations will be given to The Pinellas Sheriff’s Police Athletic League to help families over the holidays.